BEND, OR -- A John Day man was killed in a crash just east of Bend, Sunday evening. According to State Police, 55-year-old Kevin Faber was southbound on Hamby Road when he stopped at the stop sign at Highway 20. 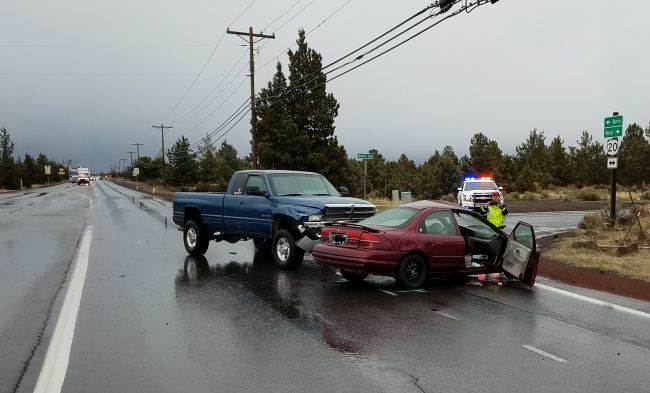 Investigators say he pulled out in front of a Dodge pickup and was struck on the driver's side door, at about 5:45 p.m.
Faber was pronounced dead at the scene; his passenger, Dalena Norton, also of John Day, was taken to the hospital with non-life threatening injuries. Neither the driver of the pickup, 33-year-old David Rausch, nor his passenger was hurt. Highway 20 was shut down for about an hour and was partially closed for another hour and a half to allow for the investigation.